As new Tripawd Miss Roxy discovered, a skin abscess after amputation surgery is icky, but it’s not an unusual occurrence. If your dog develops an abscess after leg amputation, here are a few things to keep in mind. Abscesses are skin punctures that become infected. An amputation incision always carries a risk of becoming infected. When this happens, bacteria such as E.coli or staphylococcus. or even a surgery staple, can cause redness, swelling and discharge. If you notice any unusual swelling or discharge around the surgical site, see your vet immediately. Do not use hydrogen peroxide or any other antibiotic ointment or cleanser to treat it yourself. Always see your veterinarian first. An exam can help determine the seriousness of the abscess. Your dog will be examined for signs of fever, dead tissue around the wound, and swollen lymph nodes. The extent of the symptoms displayed will determine how the abscess is treated. For a minor abscess, your dog will probably receive a round of antibiotics to fight infection and speed healing. A culture test may be required to determine the best type of antibiotic. Although tea tree oil is effective in treating certain skin conditions in pets, it has not been proven to be superior to other traditional medications. In fact, the concentrations of tea tree oil suggested for many skin problems far exceed the concentrations found in most pet products (.1%-1%). The attraction of using a natural product as opposed to a man-made synthetic treatment may not be worth the risk. Another good option for cleaning around the wound, but not on or inside it, is Tea Tree Oil. No house should be without it, tea tree oil is safe for everyone from animals to babies to elderly people. Tea Tree Oil is a 100% natural antiseptic that kills germs, brings instant relief of itchiness and irritation, and won’t irritate the skin. Place a drop or two on a clean, sterile gauze pad and use it to wipe off drainage around the abscess. When you go home, help keep your dog from scratching the abscess by putting your favorite Tripawds t-shirt, boxer shorts or small underwear over your dog’s wound. An e-collar is another great way to prevent your dog from scratching and licking the area. Make sure your dog is confined, indoors and kept away from rough play. This will enable the wound to heal faster. Most abscesses don’t require surgical treatment, but it’s not unheard of. When an abscess is more serious it might be “”better treated with surgical draining, flushing, debridement, and repair in addition to antibiotics,” according to The Animal Pet Doctor. A steroid or antihistamine may also be advised, to alleviate itchiness and swelling. Keep an eye on the wound, make sure it’s kept clean and free of debris and watch for signs of further infection (more drainage, smelly fluid and swelling). If symptoms persist, call your vet immediately. 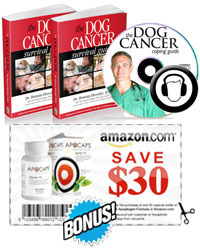 VetInfo.com: How are Dog Abscesses Caused? NOTE: We are not veterinarians. All information provided here is based only on our own experiences and those of other Tripawds members. Please consult your veterinary professional and do further research before implementing any medical treatment plans for your Tripawd.